I thought I would share a sneak peek with you today!! 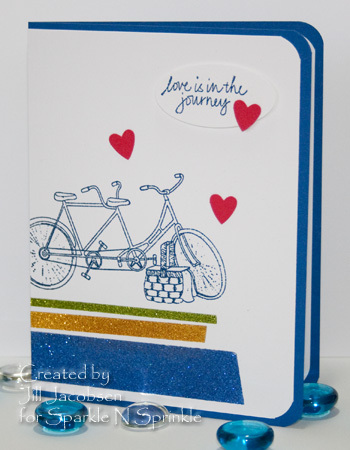 Sparkle N Sprinkle has some new stamps coming out soon from Beccy Muir. I love bike riding and this set is so good for spring and summer! I love the sentiments in this set and I think you will too! I embossed the images using the Tuscany EP's. The glitter strips on the top card are using the Velvet glitters, the bottom is a new color, Cobalt Glaze and it is awesome! Your cards look fabulous Jill! I love that gorgeous glitter, and the cobalt glaze is a beautiful colour... it looks great with the pink. Love these cards and looking forward to getting the set. Love that new cobalt glaze. Super cards Jill! Love the stripes at the bottom of the first card. That new Cobalt Glaze looks fabulous! 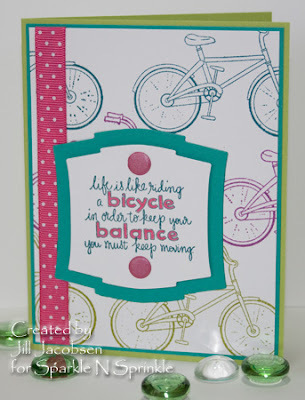 Love all the cards you've done with the bike set Jill (including the video kit one)! They're ALL fabulous!! This is such a great set. I got mine last week and have so many great ideas floating around for it now! Can't wait to try it out as soon as I get a chance. My family loves to go bike riding too. Unfortunately, it's still been so cold around here that we've only had one really good day to get out on the trails so far this year. But I had the same thought; this will make such a great scrap page. I hope I get to make one for one of our outings too! This is such a cute set of stamps and I love how you used the bike for the main image and then for the background. Great cards!